My grandpap, Andy Kozusko Sr., loved lemon meringue pie. My grandma Zella would make it occasionally, a labor-intensive affair involving carefully formed crust, homemade filling, and cloud-like meringue. He always proclaimed it delicious, and thanked her for making one of his favorite treats. Girls from Pittsburgh seem to have special relationships with their grandpaps (in itself, a very Pittsburgh word). I had the fortune of living just five doors up from mine, able at any moment to skip down the sidewalk and stand by his side at his work bench or help him weed the vegetable garden. Our birthdays were four days apart, so they were often celebrated together; the year I turned five and he turned 61, we shared a Strawberry Shortcake-themed birthday cake. He was the gentlest of souls, and I lost him to lung cancer when I was in high school. To this very moment, I miss him as if it just happened yesterday. If he were still on this earth, my grandpap would have turned 92 last week, so I made these cookies in honor and memory of him. Like his favorite lemon meringue pie, they are also quite labor-intensive, so I’m providing two ways of preparation for those who are short on time. Prepare egg wash by whisking egg and water together; set aside. 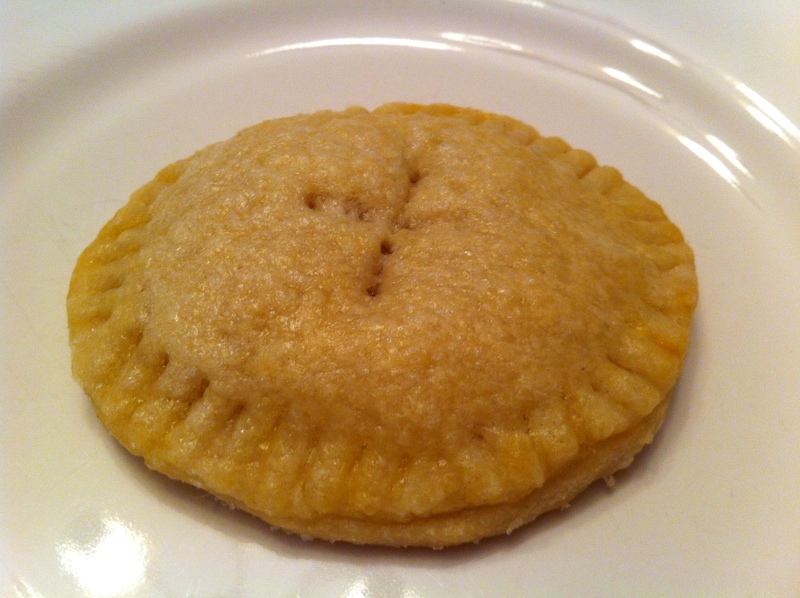 Prepare pie crust and roll out to about 1/4 inch thickness. Using a 3-inch cookie cutter, cut circles and set aside; re-roll scraps and continue cutting circles of dough until you’ve used it all and have an equal number of top circles and bottom circles for the cookies. Take each circle and roll it out again, to about 1/8 inch thickness; you want the crust to be thin, but not so thin the cookies will burst when baking. Spread about 1 teaspoon of lemon curd onto one circle, leaving about 1/4 inch border at the edge, then top it with another circle of dough. Pinch the edges together, place on the prepared cookie sheet, then press the edges closed with the tines of a fork. You should be able to fit about 6 cookies on each cookie sheet; once your sheet is full, brush each cookie with the egg wash, sprinkle it with sugar, and cut a vent in the top of each cookie. Bake for 15-20 minutes, until edges just begin to turn golden brown. Remove from cookie sheets and cool on a wire rack. Version 2: Please note that this is not how I prepared my cookies, though the original recipe called for this kind of preparation using store-bought pie dough. Prepare pie crust and roll out two circles to about 1/4 inch thickness and 9 inches in diameter; it will be important for your crusts to line up so that you can place one over the other. On the bottom crust, spread lemon curd, leaving about 1/4 inch border at the edges. Using a 3-inch cookie cutter, cut through both layers of crust. Transfer cookies to prepared cookie sheets and press edges to seal, brush with egg wash, sprinkle with sugar, and cut a vent in each top. Bake for 15-20 minutes, until edges are just golden brown. Remove from cookie sheets and cool on a wire rack.